You’ve heard about Sponsored InMail, probably even received one, but maybe you aren’t entirely sure how it works. 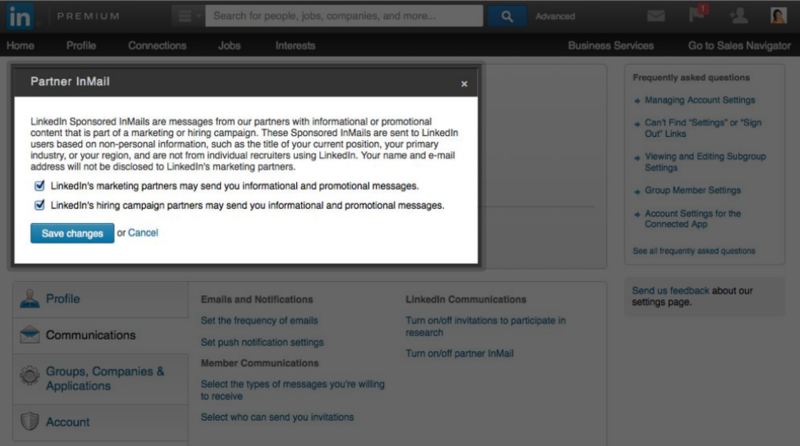 That’s understandable In short, LinkedIn’s Sponsored InMail is a way for brands to connect directly with a professional audience on LinkedIn’s messenger platform. Every Sponsored InMail is designed to maximize engagement, conversions and brand impact. Of course, reaching a highly targeted audience helps, as does the ability to attribute the role your LinkedIn ads play in conversion. Eager to know more about what makes Sponsored InMail so effective? Here’s a quick rundown of its most important features. Custom Greeting: A custom greeting helps convey a sense of warmth and personal touch. All Sponsored InMail should be written in a conversational tone, and address the recipient by name. Easy-to-Navigate Left Pane: For InMail accessed on a desktop, recent messages will display in descending form on the left side of your message. Your Sponsored InMail will appear on this list, highlighted in blue. Easy-to-Read Formatting: With most Sponsored InMail being opened on mobile devices, formatting is crucial to getting your message read. Break up large blocks of text into multiple paragraphs, include bullet points and bolding to organize content and highlight your key points, and keep your message to 1,000 characters or less. Image Banner for Branding Impact: One of the benefits of Sponsored InMail is that you can pair a custom message with a relevant display ad, which maximizes its potential for engagement. Custom Call-to-Action Button: Customize your call-to-action button to offer a clear next step for professionals who are interested in what you have to offer. 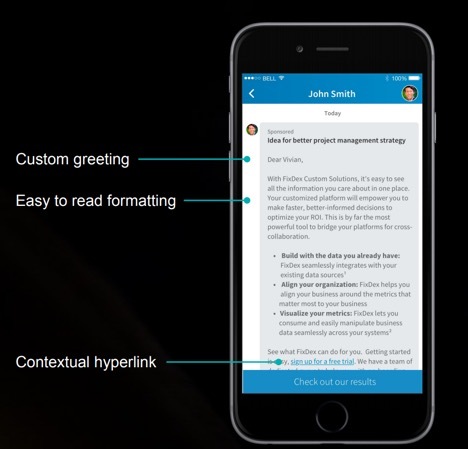 Contextual Hyperlink: In addition to the customizable CTA button, you can also present a CTA message in the form of a contextual hyperlink. This link will refer to the landing page you have selected for your Sponsored InMail. Easy-to-Navigate Opt-Out Menu: For LinkedIn users who don’t want to receive marketing and promotional messages through Sponsored InMail, an easy-to-navigate opt-out menu is accessible from every message. This ensures that your InMail budget isn’t directed toward recipients who have no interest in receiving these communications. Instead, you only deliver your messages to a relevant, interested audience. Sponsored InMail is designed to maximize engagement while keeping its recipients happy. The result is a one-of-a-kind communication platform that benefits sender and recipient alike. Get started today: Create your first Sponsored InMail.